A 20-year-old man appeared in court on Wednesday charged with plotting to assassinate British Prime Minister Theresa May in a bomb and knife attack. 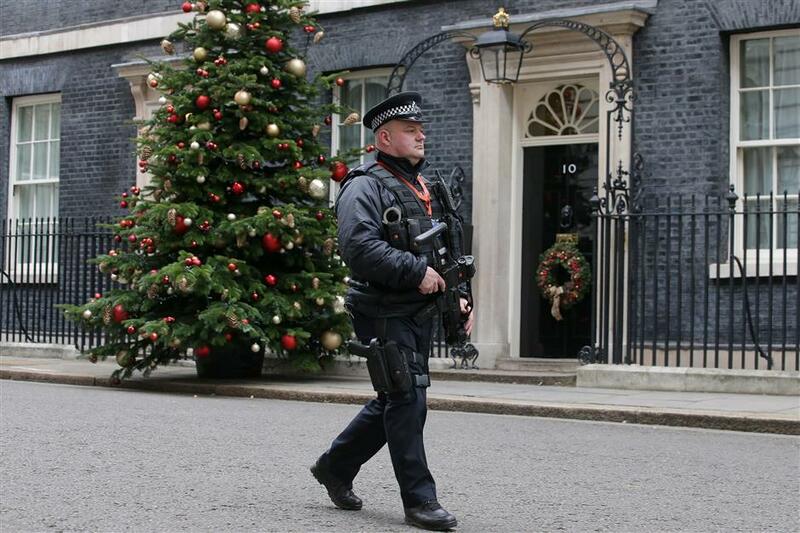 An armed police carries his automatic weapon as he walks on patrol outside 10 Downing Street in central London on December 6, 2017. Naa’imur Zakariyah Rahman is accused of planning an explosion outside May’s Downing Street office then trying to enter the building with a suicide vest and a knife in a bid to kill her. State prosecutor Mark Carroll said Rahman planned to detonate an improvised explosive device at the Downing Street gates, then, in the ensuing chaos, try to enter the building “with a view to trying to kill the prime minister”. He planned to use a suicide vest, pepper spray and a knife, Carroll told Westminster Magistrates Court in London. Rahman had carried out hostile reconnaissance of the area as part of his preparation, it is alleged. Rahman is charged with preparing terrorist acts and also with assisting another man, Mohammad Aqib Imran, to prepare separate terror acts. He appeared in court alongside Imran, 21, who is accused of trying to join the Islamic State jihadist terror group by trying to obtain a fake passport with a view to travelling to Libya. The men were arrested on November 28. Imran said he was “Pakistani British”. They both appeared wearing grey tracksuits. Rahman had long black hair while Imran had shorter hair and a beard. Lawyers for the pair gave no indication of their plea on their first court appearance so not guilty pleas were formally registered. The hearing lasted under 10 minutes. Chief Magistrate Emma Arbuthnot remanded Rahman and Imran in custody to appear for a short hearing at England’s Old Bailey central criminal court on December 20. The court appearance came a day after Home Secretary Amber Rudd told parliament that 22 Islamist terror plots had been thwarted since the killing of a British soldier on a London street by two Islamist extremists in 2013.